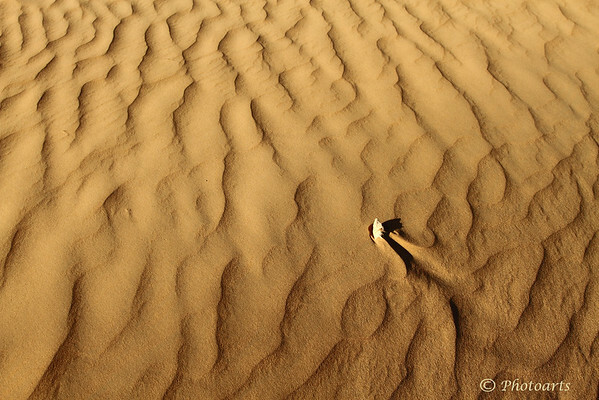 In desert sands of UAE, a piece of bone likely from an animal long lost, interrupts the patterns of sand formed by the wind as if to swim against the currents at sea. Natural patterns of sand formed by wind evoke the imagination. Without the bone for a size reference, the image could be read as an aerial view of a vast dune field. Neat. I like this shot as it conveys both dimensions, of time and space !! Excellent find and shot !! The patterns and golden tones in this scene are fantastic. Nice work! Great patterns and textures, nice shot! Love the textures and patterns! Outstanding shot! I love the patterns and texture!